Home / FILIPINO FILMS / FILM FESTIVALS / (Updated) "Imbisibol": From Stage Play to Independent Film Festival! (Updated) "Imbisibol": From Stage Play to Independent Film Festival! From the critically-acclaimed one-act play of Herlyn Gail Alegre in the 9th Virgin Labfest in 2013, and one of the well-responded plays during that time, comes an independent movie to be shown in the upcoming Sinag Maynila Film Festival 2015. "Imbisibol" the movie is a narrative story of four individuals who struggle with the challenges of living in Japan. The movie follows the individual lives of four Filipinos working in Japan - Linda, Benjie, Manuel, and Rodel - whose lives were caught together between the intertwining web of events and the complex game of hide and seek living in Japan, where the only way to survive is to stay invisible. As threats of arrest and deportation come closer to everyone's end, their friendship, loyalties, and values are to be tested. "Imbisibol" the movie is one of the official entries to the first-ever Sinag Maynila Independent Film Festival as spearheaded by Mr. Wilson Tieng of Solar Entertainment and Mr. Brilliante Ma. Mendoza. The remaining entries include "Swap," directed by Remton Zuasola, "Ninja Party" as directed by Jim Libiran, "Bambanti" by Zig Dulay, and "Balut Country" by Paul Sta. Ana. "Imbisibol" the movie is directed by Lawrence Fajardo from the screenplay adaptation of John Paul Bedia and Herlyn Gail Alegre. The Sinag Maynila Independent Film Festival 2015 will run from March 18 to 24, 2015 in select SM Cinemas made possible by Solar Entertainment Corporation's Wilson Tieng and director Brillante Mendoza. The film festival aims to support local independent cinema and filmmakers. It will showcase works from notable directors in local indie cinema. 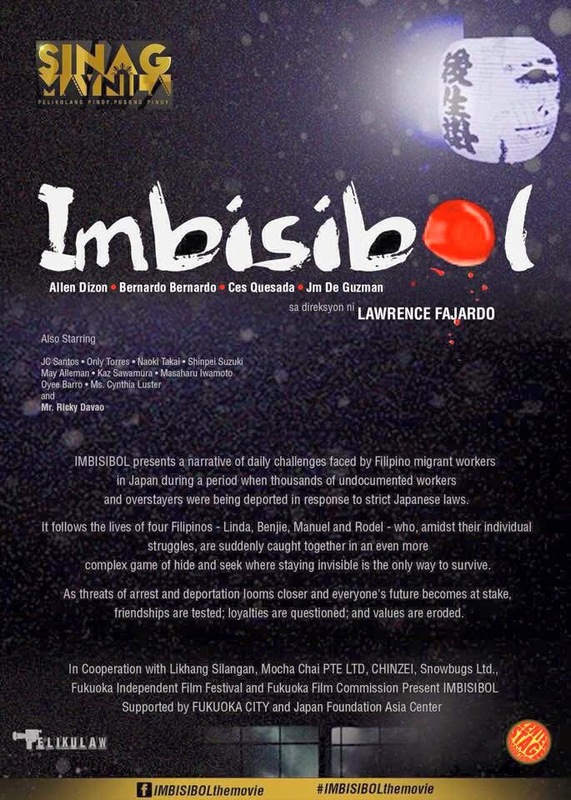 The cast of "Imbisibol" is composed of the most notable and most visible artists in the mainstream television and independent films as well. Some of the cast members include Ricky Davao, Ces Quesada, Allen Dizon, and the most recently visible actor today with the recently concluded "That Thing Called Tadhana," JM De Guzman. Former "Home Along Da Riles" star, Bernardo Bernardo (yes, that was not a typographial error!) also joins the stellar cast. Below is the much-awaited movie trailer of "Imbisibol." Post by Keep Me Posted, Inc.
"Imbisibol" the movie is one of the official entries to the Sinag Maynila Independent Film Festival 2015. The movie trailer for "Imbisibol" is coming very soon. The Sinag Maynila Independent Film Festival will be held from March 18 to March 24, 2015 and will be shown in select SM Cinemas. See you there!